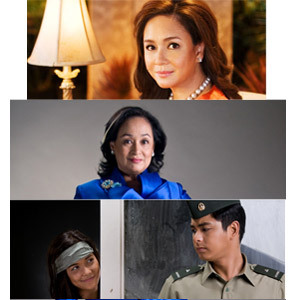 ABS-CBN shows that led in August 2011 were (from top to bottom) Maalaala Mo Kaya (hosted by Charo Santos-Concio); 100 Days to Heaven (topbilled by Coney Reyes); and Minsan Lang Kita Iibigin (starring Maja Salvador and Coco Martin). "More households in the Philippines tune in to ABS-CBN to be entertained and informed, especially when TV levels peak at its highest during primetime from 6 PM to 12 midnight. "Data from Kantar Media showed that ABS-CBN remains to be the number one TV network with a national audience share of 43 percent in August 2011 primetime or a whopping 13-point lead over GMA’s 30 percent. "Advertisers, which invest majority of their TV ad spending on primetime, look at the TV ratings and audience shares of programs and TV networks to place their TV commercials in order to reach more households as frequently and efficiently as possible. "ABS-CBN programs secured 13 out of the top 15 most-watched programs in the country, making it the top choice for advertisers to put their advertising budget. "The multi-awarded and longest running drama anthology in Asia MMK (33.7%) hosted by ABS-CBN President Charo Santos-Concio took the top spot followed by weekday top-rater 100 Days to Heaven (31%) and the recently concluded top-caliber action-drama series Minsan Lang Kita Iibigin (30.9%). "TV Patrol also ruled all newscasts in the country and secured the sixth spot with an average national rating of 28.6% as compared to its rival 24 Oras with only 19.5%. "Newly premiered programs My Binondo Girl (28%), Junior Masterchef Pinoy Edition (27.8%), and Maria la del Barrio (22.6%) also fared well on its pilot airings and instantly rose to ranks of the monthly top 15. "Other Kapamilya programs in top 15 most-watched programs nationwide for August are Pilipinas Got Talent (Sunday) (29.5%), Pilipinas Got Talent (Saturday)" (28.6%), Guns and Roses (27%), Rated K (26.3%), Mula sa Puso (23.5%), and Junior Masterchef Pinoy Edition: The Appetizer (22.9). "ABS-CBN obtained a national TV audience share of 36% in August, higher than GMA’s 35%. "Kantar Media has 22 TV networks, ad agencies, and pan-regional networks subscribing to its ratings services. Among its current subscribers are ABS-CBN, NBN, Sky Cable, J. Romero and Associates, Adformatix, Starcom, OMD, PhD, Mediacom, Mindshare, MEC, Maxus, Universal McCann, and Wellmade Manufacturing Corporation. They also include pan-regional networks likes CSM Media Inc., Fox International Channels, Star HK, Discovery, AXN, HBO, MTV, and Sony Pictures Television International. "ABS-CBN shifted to Kantar Media/TNS after filing a case vs. AGB Nielsen Media Research for failing to comply with its request to investigate alleged cheating and data tampering in TV ratings. The case is still pending in court. "ABS-CBN registered a consolidated net income of P976 million in the first three months of 2011, while GMA Network reported a P534 million net income in the same period. "ABS-CBN’s earnings before interest, taxes, depreciation and amortization or EBITDA hit P2.1 billion in the first quarter of 2011 while GMA Network’s EBITDA was P926 million. ABS-CBN delivered consolidated revenues of P6.6 billion from advertising and consumer sales."